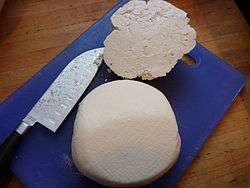 Mizithra or myzithra (Greek: μυζήθρα [miˈziθra]) is a fresh cheese made with milk and whey from sheep and/or goats. The ratio of milk to whey usually is 7 to 3. Production resembles that of Italian ricotta, though mizithra is typically drier. Mizithra can be salt-dried to produce a mature salty cheese. It is primarily produced on the island of Crete but is widespread throughout Greece. It is essentially the same as Anthotyros though the latter may contain some cow's milk. In Cyprus a similar cheese is known as "Anari" (Αναρή in Greek, Nor in Cypriot Turkish, Lor in Turkish). Mizithra is made from raw, whole ewe's or goat's milk in the simplest way possible: milk is brought to a slow boil for a few minutes and then curdled by adding rennet or whey from a previous batch (see below) or else some acidic substance such as lemon juice, vinegar or even a fresh broken fig tree sprig. As soon as curds have formed they are poured into a cheesecloth bag and hung to drain. The whey dripping out of the bag can be used to curdle the next batch of mizithra. After a few days mizithra forms a sweet, moist, soft mass molded in the shape of the hanging bag with a rounded bottom and a conical, wrinkly top. At this stage it is called "sweet" or "fresh mizithra" and may be eaten or, often, baked in pies. Xynomizithra (sour mizithra) has a more acidic, sour flavor. It is created by rubbing fresh mizithra with coarse salt and letting it age, usually hung in cloth bags. The longer it ages the denser, saltier and sourer it becomes. It can ultimately turn into a very dense, hard, white cheese suitable for fine grating. Hard or dried mizithra is also called anthotyro xero. The cheese is soft, snow-white, creamy, and moist. Since no salt is added to mizithra it has an almost sweet and milky taste. It is eaten as dessert with honey or as mezes with olives and tomato. It is used as a table cheese, as well as in salads, pastries and in baking, notably in little cheese pies (handful size) and Sfakiani pita (pie from the Sfakia region). In its salted, aged form it is considered the grating cheese par excellence of Greek cuisine, and is especially suited for sprinkling over hot pasta.